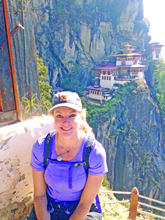 Montana Artist Amber Jean, Taktsang Monastery. Riding with her driver over the Chelela Pass, Jean describes the journey as other worldly, or perhaps like being in two worlds at once. She called her husband Raymond who was back in Livingston to share the experience. Hearing tropical birds in the background, he seemed a little confused. She shared the sentiment, explaining how crazy it was that yaks were on one side of the mountain, and monkeys on the other. Beyond the landscape, Jean also points out how different the road signs are in Bhutan. They read more like thoughtful poems than rules. “You can’t get away from that kind of politeness, sincerity, jolliness—people just want you to be happy,” she said. Bhutan measures economic progress by Gross National Happiness instead of the standard Gross Domestic Product, and according to Jean, it’s working. The jolly people, beautiful landscape and simplified, more present lifestyle created the ideal environment for the retreat-like experience Jean was hoping for, but also fearful of. Jean’s acceptance of the Prime Minister’s invitation to carve inside a new retreat home for the King amounted to so much more than getting to travel and experience a new culture. She had made a public commitment to create. Before stepping on the plane to Bhutan on November 8 of last year, in Jean’s mind, she was going to “Bhutcamp.” She had a number of personal hurdles to overcome if she were in fact going to carve for the king. Bhutan is made up of 20 districts, and in each district the king and his family have a retreat house they stay in while visiting. In the Haa District, though, along the western border, King Jigme and his wife Queen Jetsum gave up their retreat home so that it could be used as a hospital. Wanting to give the king and his family a retreat home in Haa, the Prime Minister hired Ken Ryder, owner of Bozeman-based Ken Ryder Construction, as the general contractor for the project. Ryder first visited Bhutan 20 years ago, when he was invited to analyze the methods used for a variety of building projects throughout the country, and determine what new mechanized technologies should be introduced to their system. “I fell absolutely in love with Bhutan on this trip,” Ryder said. After a 10 year hiatus, Ryder was itching to return to the country. So, in the spring of 2015, he emailed the Prime Minister, Tshering Tobgay. “I explained that it had always been an interest of mine to implement some type of apprenticeship training program for the young people of Bhutan, teaching them our western methods of building,” Ken said in email that he sent from Bangkok, Thailand. Ryder says this must have struck a responsive chord, as Tobgay replied the very same day, welcoming the idea. Keeping in line with the country’s goals of being innovative and sustainable, yet also holding on to their cultural traditions, the government wanted to use local building materials while introducing a new style—a western style. After a few days of communication, Tobgay asked if Ryder wanted to put together a team of volunteers from Montana to come over and build an authentic Rocky Mountain style log cabin for the Royal Family in Bhutan—the country’s first log home. With Bhutan’s deep, revered culture of woodcarvers, a craft necessary to the design of the cabin, recommending Amber Jean for the project was a no brainer. 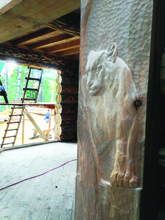 Jean’s snow leopard wood carving, King’s retreat, Haa District. He also described her as a risk taker with a love for adventure and trying new things—a fitting description for Bhutan’s first female carver. Amber Jean undoubtedly has the skill and talent to create a magnificent carving for the royal family’s retreat home in Haa. But the circumstances for this project were totally different than anything she had done. She hadn’t used power tools or completed any carvings in over a year. She couldn’t bring herself to create. All she could draw were faces of demon dogs that haunted her after being viciously attacked by three pitbulls while riding her bike in the summer of 2015. Jean’s studio sits on her property at the end of a dirt road near the top of the Wineglass Mountain just south of Livingston. For her daily commute, she walks through the woods from her home to her studio. She’s lived and worked up there for nearly 25 years. “It’s pretty idyllic and really sweet, but I also have a lot of seclusion and quietude in my work,” she said. Jean describes herself as a disciplined artist, with the majority of her days spent in the studio working. “I’ve had a practice for years where I don’t use social media before noon or use any technology or do office stuff. It breaks my process,” she said. As her mother’s health started to fail, though, Jean broke her rules so she could take care of her mom. And then the dog pack attack completely derailed everything. In Bhutan, her studio and the commute to work looked a little different. Every morning in Haa, at 8:00 a.m., Jean would sit outside the Risum Resort and wait for a pickup truck that would take her to work. Jean was given creative freedom for the project. On her first day at the job, she met with Dahla, the other carver, to discuss their design plans. Inside the retreat house, Dahla and Jean had been tasked to carve the entry way between the living and dining rooms, made of Himalayan Blue Pine and measuring 13 feet long by 8 feet high. Dahla was responsible for carving the dining room side while Jean worked on the living room side. Jean was hoping they could weave their designs together, but Dahla said he couldn’t dishonor his teacher by varying from what he had been taught. He wanted to stick with the traditional seven symbols of Bhutan. Keeping in line with the theme of East meets West, Jean decided to create a realistic carving of a snow leopard and a mountain lion, weaving them in a way that would make them appear as if they were coming out of the wood, towards the viewer. Realistic relief carving comes as no small task. But because designs in Bhutan are so stylized and traditional, Jean felt she needed to create a contrast. Battling her fears head on, Jean tackled the snow leopard first — the most technically challenging part of the design. “Although it would’ve been easier to do a traditional carving, doing the relief seemed like the right thing to do,” she said. After working tirelessly five and half days a week for a little over a month, she virtually completed the snow leopard. While Jean’s carving is coming along nicely, perhaps the biggest achievement was her ability to use power tools again—a breakthrough that occurred Thanksgiving Day. On December 13, she returned to Livingston. In March, she will travel back to Bhutan to continue carving, hoping to be done by next fall. Although Jean is still processing her first trip to Bhutan, she says the project helped her reset. Jean’s determination, strength and open nature are all evident when speaking with her. She is not shy about her experiences. She lets you in. Her art communicates in a similar way. An optimism surely shared by Bhutan’s royal family as well.